As mentioned via Twitter, HootSuite is currently down. We will do our best to keep you up to date on the status. Media Bistro – HootSuite Offline for Hours: How Are You Coping? As Mashable reports, HootSuite is suffering downtime alongside FourSquare and Reddit, due to some technical problems with Amazon’s servers. Amazon Web Services caused several popular Web sites to crash this morning. HootSuite, a social media aggregator, was among them, causing our resident social media gurus problems. And good luck if you were trying to be a mayor of Foursquare or ask pressing questions on Quora; those sites crashed too. Ow.ly & Ht.ly back up. Ow.ly & Ht.ly are again offline. Ow.ly & Ht.ly (HootSuite’s URL shortener services) are back on-line meaning all ow.ly/ht.ly links will now work and you can continue to shorten links and store files on this service. Additionally, all custom URL shorteners are back online. For the record, here are a few articles about the widespread situation affecting many other web sites along with HootSuite.com. We understand the frustrations of our users and are very eager to resolve this problem. Service disruption: Instance connectivity, latency and error rates. A number of people have asked us for an ETA on when well be fully recovered. We deeply understand why this is important and promise to share this information as soon as we have an estimate that we believe is close to accurate. Our high-level ballpark right now is that the ETA is a few hours. We can assure you that all-hands are on deck to recover as quickly as possible. Well update the community as we have more information. Some of Amazon’s AWS services, which together comprise the company’s cloud computing platform, are currently experiencing technical difficulties, and it’s very visible on the social web. HootSuite, Reddit and Foursquare are some of the sites that rely on Amazon AWS, and all of them are either down or have recently experienced downtime or latency issues. Quora and Formspring also appear to be down Thursday morning. The issues are also visible on Amazon’s AWS Service Health Dashboard, which is showing problems with several services, namely Amazon Elastic Compute Cloud, Amazon Relational Database Service and Amazon Elastic Beanstalk. The popularity of Amazon’s cheap, easily scalable hosting is showing its downside right now, with a number of popular websites and services throwing up errors or being down completely. 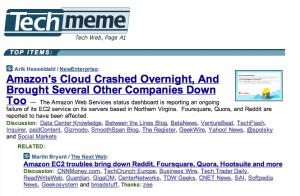 Foursquare, Quora, Reddit, Moby and Hootsuite are among those affected by technical troubles on Amazon’s servers. The company’s status dashboard currently shows problems with the company’s Elastic Compute Cloud and Relational Database Service operations, based in North Virginia, with connectivity issues confirmed. We can confirm connectivity errors impacting EC2 instances and increased latencies impacting EBS volumes in multiple availability zones in the US-EAST-1 region. Increased error rates are affecting EBS CreateVolume API calls. We continue to work towards resolution. Update: Here’s more companies that are affected by the outage, according to status updates on Twitter. Hootsuite, the cloud-based Twitter client, is down because of the outage too. Here’s what the site looks like right now. Also down is the Hootsuite URL shortener ow.ly. Amazon’s affordable cloud-based EC2 (Elastic Compute Cloud) Web hosting service has attracted many popular startups in the social media space, and technical issues this morning have taken down several popular services including Foursquare, Reddit, Quora, Hootsuite and Moby. Amazon obviously has a huge online retail presence, but the company is also one of the world’s leading cloud services providers — startups are drawn to EC2’s variable pricing model that lets them scale as they grow. Unfortunately, with these sites being hosted on a single service, a big outage has been able to take down a swath of the social Web. Amazon says it’s still working on the issue. According to its status dashboard, Amazon’s North Virginia servers started experiencing problems at 1:41 AM, and it’s still causing downtime issues at all of the sites. For the latest, check Foursquare, Reddit, Quora and Hootsuite. I use Hootsuite everyday. As often as I eat food and use toilet paper. As often as I wash my hands and look out the window to check the weather. Today, it’s down, as well as Foursquare, Reddit and other services relying on Amazon’s cloud service. Twitter is full of folks adrift and a’ranting over the outage. We’ll continue to update as possible. Thanks for your patience as we work diligently to resolve this.